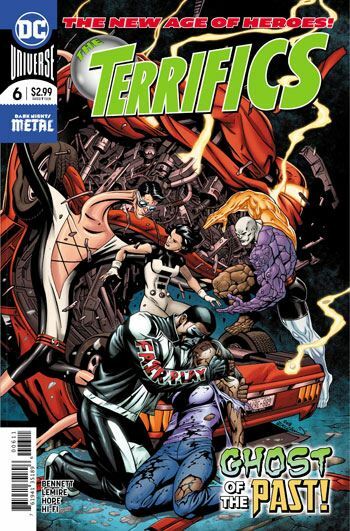 The Terrifics deal with Algon, the predecessor of Metamorpho, in the latest issue. It’s another high energy tale, visually dynamic, and even has a dash of character development along the way. I really like the way the book is using pages with four panel layouts as a regular feature. It allows for some nice parallel storytelling techniques, and ensures that each of the team members gets their share of the focus. Otherwise, there actually isn’t a lot to say about this one. I guess perhaps I liked it a bit less than earlier issues, though only marginally. I do wish each story was longer, but that’s a statement I could make about every comic book tale these days. We do get to find out who has been behind the various troubles that the Terrifics have been dealing with since their book began, and this serves to tease a crossover with one of Alan Moore’s creations. I really love how much fun the artists are having with this one. Metamorpho and Plastic Man, as well as Algon and the Element Dog, go through such bizarre physical states that every page deserves a second look, just to appreciate how well all of it was rendered.